Keith R. Dunleavy, M.D. CEO & Chairman of the Board, Inovalon Better care requires better information about patients. However, it is increasingly challenging for healthcare providers to accurately understand their patients as the massive amount of data collected from various sources related to population health continues to remain in disparate silos, different formats and on papers. Big data analytics helps providers of care to achieve thorough documentation of patients by turning large amounts of data into insights. The future of healthcare analytics looks promising. According to the Research and Markets’ recent report, the global healthcare analytics market is expected to grow at a double digit CAGR to reach $33,542 million by 2022. 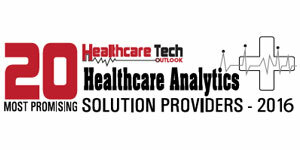 The report also reveals that various factors such as emergence of big data and advancements in analytical technologies, digitization of healthcare and federal healthcare mandates among others are driving the healthcare analytics market growth. Having developed large scale systems to aggregate and analyze clinical data, Inovalon [NASDAQ:INOV], a Road Bowie, MD-based technology company combines advanced cloud-based data analytics, and data-driven intervention platforms to help healthcare providers to achieve meaningful insight and impact financial performance across the healthcare landscape. The company’s customer base ranges from health plans, physicians, and ACOs to patients and researchers, and pharma and life sciences industry. “Inovalon is highly focused on delivering innovative technologies for the healthcare industry,” says Keith R. Dunleavy, M.D., CEO and Chairman of the Board, Inovalon. The company, in collaboration with Quest Diagnostics, a healthcare solution provider, has introduced Data Diagnostics—a suite of hundreds of analytics. This solution can be ordered by a clinician on-demand, at the point of care to deliver patient-specific results in real-time. Data Diagnostics is leveraged within nearly 600 EHR platforms to allow clinicians to access and use advanced analytics with their existing workflow at the point of care. “Data Diagnostics brings the power and benefits of transaction-based processing and advanced analytics to the healthcare ecosystem in real-time, enabling physicians to treat their patients more effectively at the point of care driving meaningful impact. This isn’t simply a new approach to managing health data, it’s a major paradigm shift that will further the transformation of healthcare as we know it,” explains Dunleavy. Inovalon has also materially expanded its application of big data platform—QSI-XL— for faster analysis of clinical quality outcomes, while also significantly reducing processing times for large datasets. The company collects data from disparate sources such as claims, laboratory, pharmacy, medical benefits, demographic information, provider information, and facility information and identifies the difference between current and desired state through the application of advanced analytics. “We believe that leveraging data, advanced analytics, and real-time decision support platforms is key to delivering on this focus,” says Dunleavy. Post-identification, Inovalon applies additional advanced analytics to close the gaps. The company aims to change the role played by data in care quality, effectiveness, and efficiency. 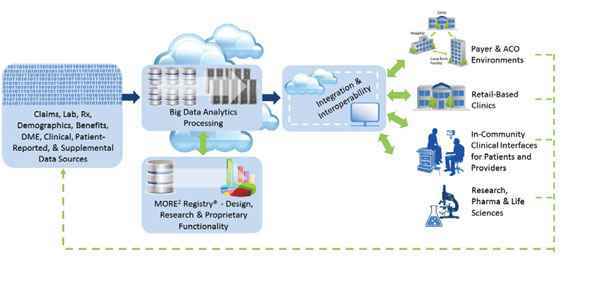 Inovalon’s data integration and management process toolset, iPort facilitates high volume data integration at enterprise scale by leveraging a decade of dataset extraction, transforming, and loading experience with data format insights gained from analysis of extensive Medical Outcomes Research for Effectiveness and Economics (MORE2) Registry dataset. Additionally, the company’s Predictive Clinical Insight System (PCIS) helps healthcare organizations in ongoing management of the patients by evaluating patients for undocumented, worsening and uncoded conditions. Inovalon also delivers an electronic patient assessment solution suite called ePASS to help point of care clinical provider to access patient specific information. This web-enabled tool is designed to support the decisions of the point of care providers. It delivers patient-level as wells as guided clinical decision support. It is difficult for healthcare organizations to attain higher standards of care and patient satisfaction, while improving financial performance. Inovalon offers solutions to help such organizations improve outcomes. The company’s integrated quality platform called Quality Spectrum enables quality measurement, reporting, improvement, strategy and research in the healthcare industry. The solution leverages advanced analytics, big data technologies, and an experienced clinical workforce that empowers clients, offers multi-year performance analysis, and facilitates decision-making at every stage. Apart from delivering quality measurement and reporting, Quality Spectrum drives value in clinical and quality outcomes, meaningful impact, and real-time business intelligence. Additionally, Inovalon’s Prospective Advantage risk score accuracy improvement solution helps healthcare providers to identify the gaps in care, assessment, and documentation to enhance health plan risk score accuracy, utilization, and patient turnover. For instance, Inovalon assisted a large health plan that was looking for ways to address a challenge posed by a growing group of dual eligibles with chronic medical conditions and other complications associated with their socio-demographic status. Inovalon’s Prospective Advantage proactively identified the target members and with significant documentation and assessment gaps, while facilitating provider encounter to help them close gaps, enhance member health, and boost financial performance. After identifying the members, Inovalon designed customized, patient-specific intervention plans that included the details such as best timing, outreach strategy, communication channel, and intervention location for each member. The company has originally developed its data and analytics platform that continuously supports and serves some of the largest health plans and separate patient populations. Inovalon operates with enterprise-grade data centers backed by a cloud technology based architecture that is highly scalable and supports on-demand capacity expansion and speed of execution. The company reduces providers and clinical facilities’ process burden by bringing analytics and insight to the point of care and integrating directly with the EHRs of many clinical facilities. Inovalon has also increased its services footprint through nationwide intervention platform to support the clients in more than 98 percent of the U.S. as well as Puerto Rico. The company also supports entire ecosystem by spending considerable time and resources to produce groundbreaking research and sharing it with industry publications, peer presentations, strategic relationships, and the media. Inovalon provides healthcare insights for diverse audiences and drive visibility and credibility while providing significant recognition for its toolsets, capabilities and innovation. Its MORE2 Registry is a vast database that acts as a representation of Inovalon’s brand as “industry innovator and thought-leader”. For more than a decade, Inovalon has been delivering great value to the customers, which has acted as a major element of reassurance for existing and potential clients. The company promises to take its rich legacy forward in a manner conducive to client partnership, while thrusting on developing new and innovative products. “We are confident that our platforms will continue to drive success for our clients and be in demand, as we continue to innovate,” concludes Dunleavy.